Copenhagen makes a convenient base for cruises to the Baltic countries and their capitals, including Helsinki, Tallinn, Riga, Stockholm and St. Petersburg. It is also an excellent departure point for cruises along Norway’s west coast to the North Cape and the midnight sun. The Danish capital’s compact dimensions packed with cafés, shops and the best restaurants in Scandinavia are perfect for exploration on two feet or two wheels. Copenhagen has no glittering skylines and hardly any of the high-stress bustle common to most capitals. Throngs of bicycles glide along in ample bike lanes. The car has almost no right of way on it’s most central cobbled streets, which wind past copper spires, sleek modernist civic buildings and quirky boutiques to chocolate-box harbourside vistas. The early morning air in the pedestrian streets of the city’s core is redolent of freshly baked bread and soap-scrubbed storefronts. Copenhagen has attractions and sights to suit every taste and interest. The city’s no.1 attraction, more than 100-year old amusement park Tivoli Gardens, is centrally situated a short distance west of the Central Train Station, while royal palaces Amalienborg and Rosenborg and museums like the National Gallery and the National Museum are also within the downtown area. Escape the capitalist crunch at Freetown Christiania, a dreadlocks-heavy commune straddling the eastern side of Christianshavn. Since its establishment by squatters in 1971, the area has drawn nonconformists from across the globe, attracted by the concept of collective business, workshops, and communal living. 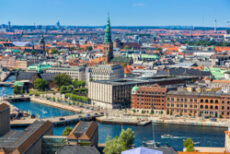 You can’t visit the Danish capital without seeing the , so head along the waterfront from Nyhavn to Kastellet and take in the iconic statue and surroundings. Kastellet is the former Citadel of Frederikshavn, the oldest parts of which date from 1625. If you’re pushed for time, a combined canal and bus tour will let you see most of the city in the space of an hour or two.